In our library building at Heriot-Watt University, Edinburgh Campus we have 21 individual study rooms, 2 group study rooms and 5 group study tables. These are bookable and, in the past, have been booked by a student coming to the library service desk and exchanging their ID card for a study room key. The rooms were distributed on a first come, first served basis and could be kept for as many hours as required in that particular day. The keys were 'issued' via the library management system. During the last academic year the numbers of students requesting to use the rooms has increased dramatically not least because the number of students using the library building has increased and space is at a premium. There was a general acceptance by students and staff that we needed a fairer system and one that offered more flexibility. From September 2014 it was proposed that booking times for the rooms were introduced so that the day was divided into 4 time slots 9.00 - 12.00, 12.00 - 15.00, 15.00 - 18.00 and 18.00 onwards. This was introduced and although offered more choice and fairer access, it was difficult to administer and took a lot of staff resource. It involved a paper-based system in conjunction with issuing the keys on the LMS. Also it was still limited to booking face to face at the time at the library service desk. So we decided to go for an online system from January 2015 and chose LibCal by Springshare. We already use libguides as do many libraries and we had a trial of three 'rooms' to test the system to see if it would work for us. I set up three rooms and asked staff to experiment booking rooms and cancelling rooms and generally having a look at how it would work for us. Just before we went live there was an update from v1 to v2 so we updated to v2. The system is easy to use and relatively easy to set up. From a student point of view they follow a link from our Information Services website http://www.hw.ac.uk/is/library-essentials/study-spaces/edinburgh.htm or enter the website address from the handout. The different rooms appear in a grid with available time slots in green. Time slots are available to book 3 days in advance. They click on a vacant slot and then enter their details in the form below i.e. name, HW email address and HW ID number. This generates an email to them asking them to confirm the booking, which generates another email informing them that the booking is confirmed. If they don't confirm the booking, it disappears after 15 minutes. Students then come along to the Service desk at the start of their booked slot and swap their ID card for a key. From a staff point of view, the screen shows all the time slots of the day and they appear in pink if booked and green if available. When you hover the mouse over the time slot, you can see the name of the student and their email address and ID number. So when a student comes to the Service Desk, staff check their details, change the time slot to 'showed up' and give out the key in exchange for the ID card. If a student doesn't turn up within 15 minutes of the start time of the booking, we can cancel it and reallocate to another student. The advantages so far are that the system provides more flexibility for students. They can book up to 3 days in advance, can book online and can book for a time slot that suits them. They can book up to 3 hours per day and so far this is not exceeding demand so everyone who has requested a room has been able to get one. The advantages for staff are that they are not having to book rooms on behalf of students and there is no paper work involved. It has required quite a bit of training for staff but most are now confident using the system. 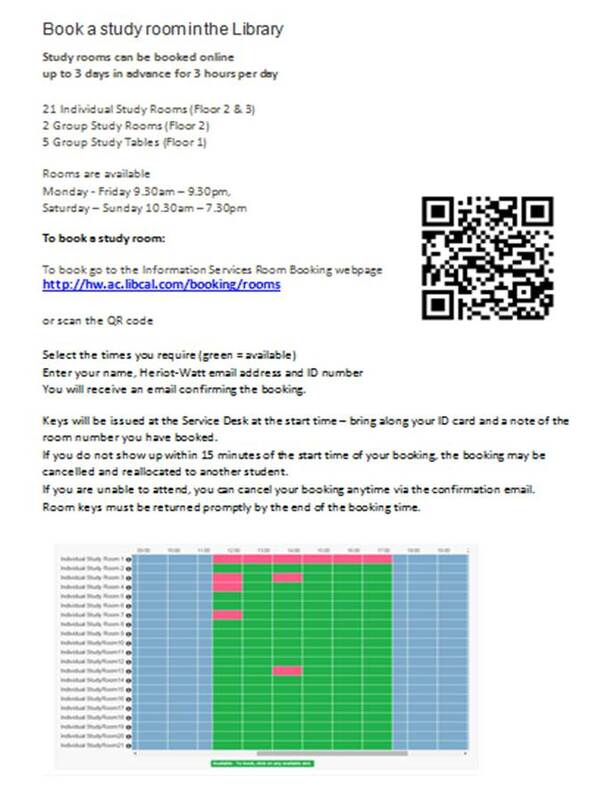 Some students would like to continue having staff book the rooms for them but this is not practical nor preferable. We can collect usage stats from the system so there doesn't seem to be a need to record the issuing of keys in the library management system. The only downside with that is it doesn't count as a loan on a students record so if they go off with the key, it won't automatically become overdue and send them a reminder. We will have to send a separate email but this doesn't happen very often. The changes that we might make in the near future are to miss out the confirmation email so that the room is booked and automatically confirmed. Feedback at the weekend from staff was that students weren't wanting to go online to the booking screen and then into a different place i.e. emails to get the confirmation email and reply to that etc. I'm not sure if this is a real problem as I think it's just part of the process of students getting used to booking online in advance. But if we took out the confirmation email, it would be one less step. I might also change the set up of rooms into different groups to make the display on the screen easier to read but that's not urgent. It would also be useful to have a dedicated PC / monitor of some sort in the library so students could make last minute bookings there and then.